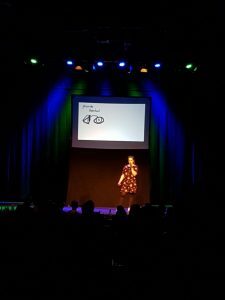 The 19th Science Slam took place in Bonn at the Pantheon in April 2018, and Ann-Charlott Schneider was declared the winner. 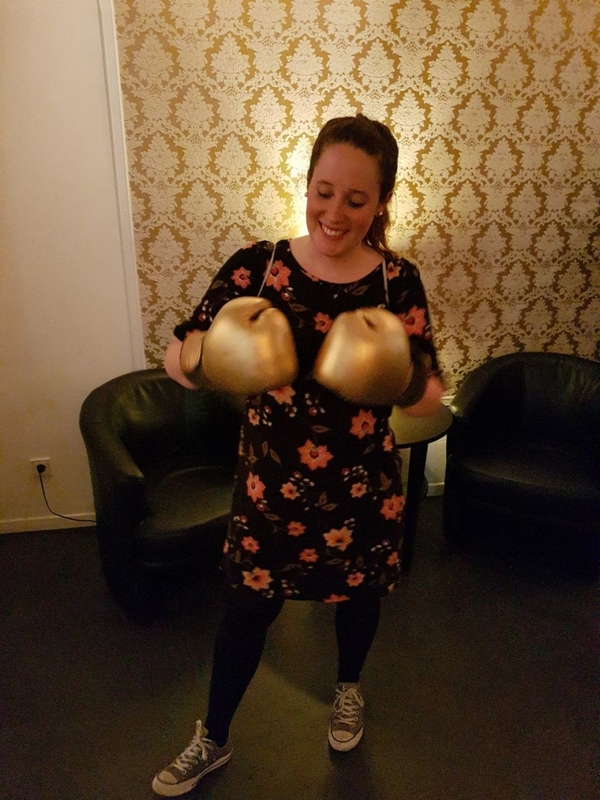 Wearing the prize of golden boxing gloves, she exited the fray, leaving behind four competitors in the last round. 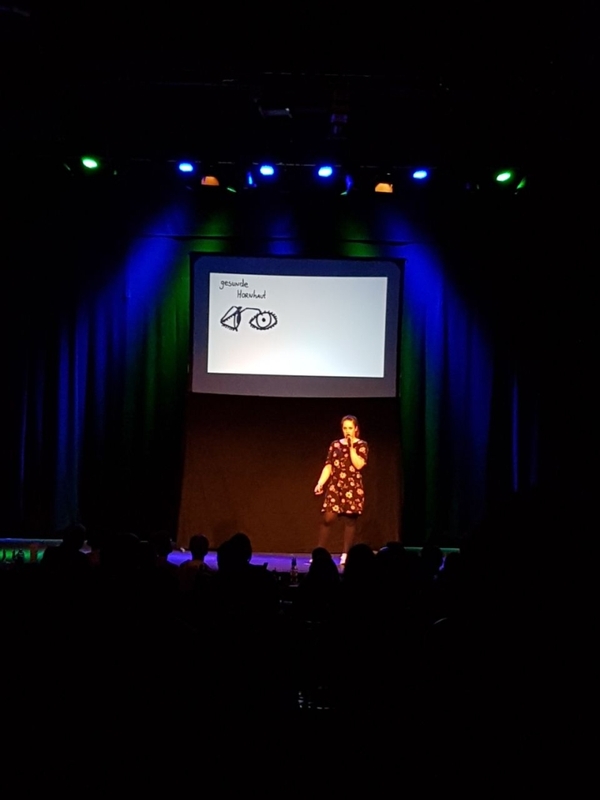 Her 10 minute performance, in which she explained the problem of corneal graft rejection in a highly accessible and entertaining way to a sold-out audience of approximately 430, was judged the best and the funniest by them. She illustrated the scientific issues using scenes of riding German trains plagued by strikes and pickpockets, which everyone can relate to. “I really like to talk about my research, because it is so exciting to me, but there came a point where I started to drive my friends crazy with it. 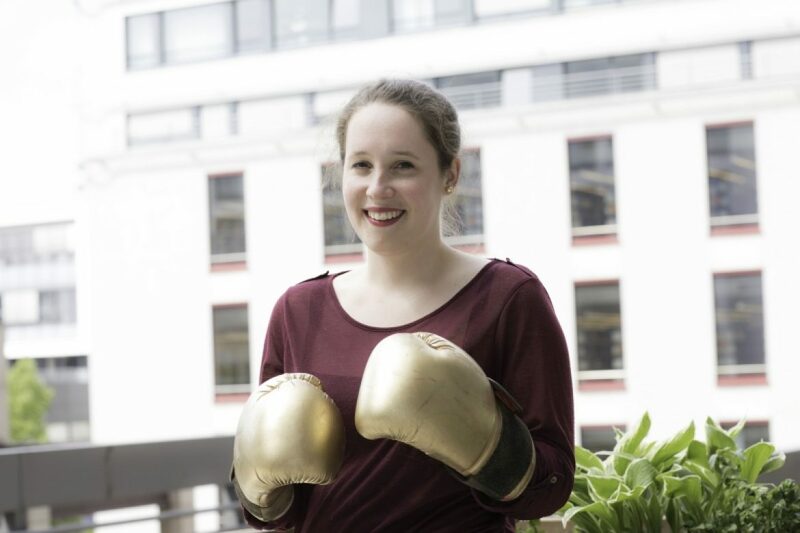 An acquaintance put me in touch with the slam,” explains the 27 year old, laughing. Ann-Charlott is an advanced PhD student in Project 1 “Induction of corneal transplant tolerance by anti(lymph)angiogenic therapy” of the German Research Foundation Research Unit FOR 2240 “Angiogenesis, Lymphangiogenesis and Cellular Immunity in Inflammatory Diseases of the Eye” in the Department of Ophthalmology at the University Hospital of Cologne. A special guest at the event was Berlin author Wladimir Kaminer. With his special brand of humor, he read from his new book “All about my wife”.